We have a lot to live for. Families. Hobbies. Careers. It's no wonder that we are always on a quest to understand and improve our health. And this quest doesn't stop on Earth—it's one of the main focal points for International Space Station research. NASA is expanding life science research on the space station with a new collection of investigations called geneLAB. This study represents NASA's leading effort to develop next-generation life science research capabilities that not only will benefit humans traveling into space, but also will help scientists understand the role genes play in human health and disease on Earth. Life science research in microgravity teaches us how space travel affects living organisms so that NASA can develop countermeasures to mitigate or cure the detrimental effects of space exposure on astronauts who embark on long-duration missions. For those of us on Earth, there are many questions about human diseases that may be answered through space research, leading to improved detection, treatment and prevention of disease. Through the development of the geneLAB model and platform, NASA is creating next-generation tools that will enable drug development and biomedical research, expanding the types of disease systems that will be impacted positively by NASA programs. "Instead of representing a particular piece of space hardware or equipment, or a single mission or study, geneLAB is a new research model that enables a wide range of science experiments that will seek to understand how exposure to spaceflight affects living issues at the biomolecular and genetic level," said D. Marshall Porterfield, Ph.D., director of Space Life and Physical Sciences in the Human Exploration and Operations Mission Directorate at NASA Headquarters in Washington. "GeneLAB experiments will take advantage of new life science research technologies that enable the measurement of the biochemical and molecular networks that relate to the genome and gene expression in an integrated way to monitor how the biology is altered by exposure to space in low-Earth orbit at the complex systems level." As part of the geneLAB campaign, scientists will send different kinds of organisms to live aboard the space station. Scientists plan to fly several types of model organisms that are routinely used in genetics research on Earth, including bacteria and fungi, plants, fruit flies, worms, fish and mice. Model organisms are nonhuman species that are widely used to research various diseases when experimentation on people would be infeasible or unethical. They are used to understand particular biological processes with the expectation that discoveries made in the model organism will impart knowledge into the workings of humans and other organisms. 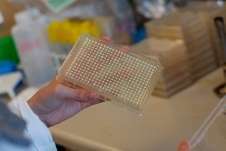 Scientists also will examine tissues taken from the crew members to look for changes in their DNA and other biological molecules while in space and after returning to Earth. Some of the geneLAB organism investigations will run for multiple generations over longer periods of time than the current astronauts have spent on the station. Long-duration experiments that support the growth of repeated generations of organisms will provide insight into long-term exposure to space on our genes. Once the campaign is in full swing, the studies will generate enormous amounts of raw data. All possible biological molecules—DNA, RNA, protein and metabolites—will be extracted from microbes, tissues and organisms at several points during space missions. The samples will be stored aboard the space station and returned to Earth for later analysis. The raw data will come from mapping the complete genes of the tissues flown in space. The data will be uploaded into a universally available life sciences database that will contain the integrated gene and biomolecular "maps" for the tissues and organisms that have flown aboard the station. "What makes the geneLAB campaign unprecedented is the comprehensive effort to create an open source database of fully coordinated genomics, proteomics and metabolomics data comparing life in space to life on Earth," said Porterfield. "Life science experiments flown in space have traditionally been accessible to only a few scientists, but the campaign will make spaceflight data available to a global community of scientists for data mining long after the missions have ended, significantly increasing the science returns for years to come." NASA's Ames Research Center in Moffett Field, Calif.; Johnson Space Center in Houston; and Kennedy Space Center in Florida will support the research projects flown as part of this campaign. The agency will provide grant funds to scientists outside of the agency to work as part of multi-investigator teams in this cutting-edge research. So the quest we always are on to live a better life is constantly leading us to healthful studies aboard the space station. Long-duration life science investigations will allow scientists to understand the effects of exposure to the space environment and to look for the possibility of genetic drift, or the variation of genes over time, in multiple generations of organisms grown on the orbiting laboratory. These studies are an important part of developing missions for humans traveling farther into the solar system than we've ever gone.